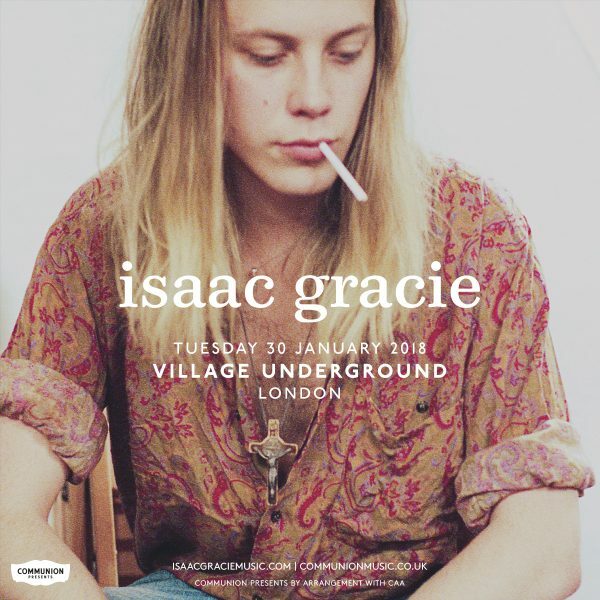 With a forthcoming UK headline tour next month, including a sold-out show at Omeara, Isaac Gracie has just announced a brand new date at London’s Village Underground on the 30th January 2018. The tour comes as a celebration of Isaac’s latest EP ‘The Death Of You & I’, which is his most characterful and accomplished piece of work yet; tender and charming, it’s the sound of a young poet comfortable dropping his words onto a page who isn’t afraid to tell stories of love and hurt. The outstanding record was largely recorded at London’s Eastcote Studios and features killer tracks such as the tender ‘Love (Aint Always So Good)’, whose husky folk tones resemble his earlier sound; whilst ‘Silhouettes Of You’ soars into an anthemic sing-a-long that will be the soundtrack to many memories this tour. In particular, his brand new single ‘One Night’ is yet another example of what he’s doing so beautifully. Co-written by one of the biggest names in electronic music right now, Muru Masa, ‘One Night’ embodies Muru Masa’s sophisticatedly smoky beats and Isaac’s moreish, keening vocals; creating a truly stand-out track. Catch Isaac Gracie performing his brand new EP, back-catalogue and fresh track ‘One Night’ on his upcoming, UK tour. Tickets on sale now. If you can’t wait until the tour, take a listen to Isaac Gracie’s new EP ‘The Death Of You & I’ below!